Photo taken by Natalija Zmavc in Winnipeg, Manitoba. 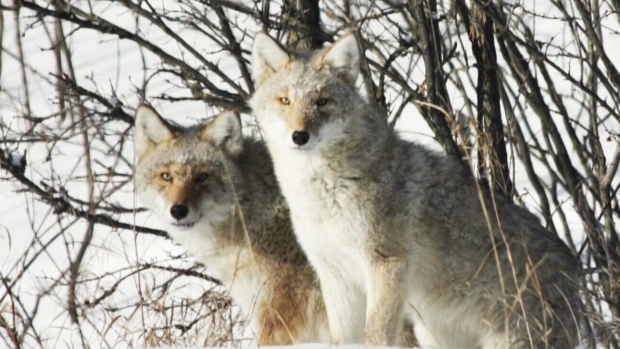 A man walking his dog in Alliston was attacked by pack of coyotes Tuesday night. The incident happened just before midnight along Albert Street. According to the OPP, the man reported eight coyotes in the pack and said three attacked him and his dog. The dog was able to fend off the coyotes. The man and his dog were not injured. According to a spokesperson from the Ministry of Natural Resources, this is coyote breeding season and a time when they are on the move and generally in packs during the hours of darkness. Officials say coyotes are very good at taking advantage of whatever food people make available. It's believed the coyotes are either being fed or they have found a food source in this area. The OPP are reminding residents to ensure their dogs are leashed while being walked and to be vigilante of roaming coyotes.